Rowing machines are one of the most efficient ways to burn calories and lose weight. They work nearly the entire body and are lower impact than many other forms of exercise machines. It used to be that rowing machines were reserved for crew houses to support the select few members of university crew teams who were willing to get up at 3:00am and train. Lucky for us, the benefits of rowing machines can now be received at any time of day and in nearly any price range. This list of the 10 Best Rowing Machines of 2018 will help you decide which type of rower will work best for your life. Whatever you choose, know that when purchasing a rowing machine you are investing in your overall health and wellness. There are few forms of exercise more conducive to burning fat and building muscle tone at the same time. And hey, if you really want the crew team experience, grab a buddy to yell “stroke!” at you while standing in front of the rower. It’ll be just like you’re on the water. Okay, maybe not just like. But still. Could be fun. 2.1 1. How Do You Want to Use Your Rower? 2.2 2. How Much Space Do You Have? 2.3 3. What is the Weight Limit? 2.4 4. How Quiet is Your Environment? 2.5 5. What’s Your Budget? This machine gives you everything you need. 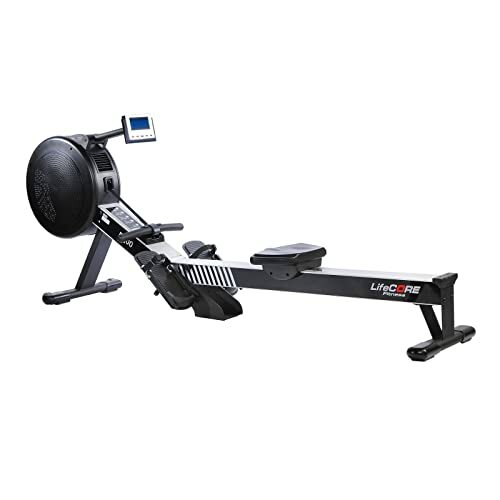 Sturdy, stable and well-built, the Concept2 is the standard on the market for rowing machines. This is the preferred choice for CrossFit boxes around the world. The backlit LCD screen allows you to easily track distance, speed, calories and time while you row and also comes programmed with games to spice up your workout. It can track the progress of up to four users, making it perfect for families. This is an air resistance machine which means it will not be totally silent, but it does not make a crazy amount of noise compared to other air resistance options. You can adjust the resistance by easily moving the damper on the side of the flywheel. The Concept2 is great for users of all heights, is easy to assemble and can be broken down into two parts and then folded when not in use. Even when folded, however, it is still bulky so if you’re planning to store it, make sure you have ample room. This machine comes with a 500lb weight capacity so you can feel more than confident in its ability to hold your weight during even the most rigorous of workouts. 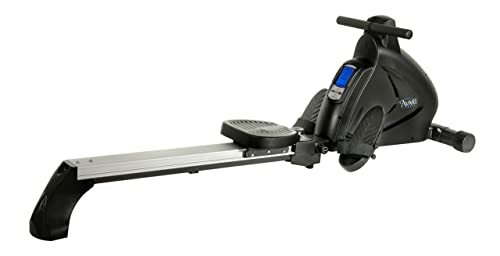 The EFITMENT Total Motion machine is great for small spaces or those who want a good workout but don’t need the intensity that something like the Concept2 will provide. This machine has separate handles on either side as opposed to one horizontal bar in the center. You can pull straight back with these handles or perform a circular motion to work the arms in a different way. The twelve levels of hydraulic cylinder resistance give you options for workout difficulty and the foot pedals have been designed to be extra-large and slip resistant, so you can be confident in every push and drive. It can sustain up to 350lbs and comes with a holder for your tablet or phone, so you can enjoy media or fitness apps while working out. The EFITMENT Total Motion does not come with wheels for portability, nor does it fold. Make sure that you assemble it where you want it and expect to keep it there. 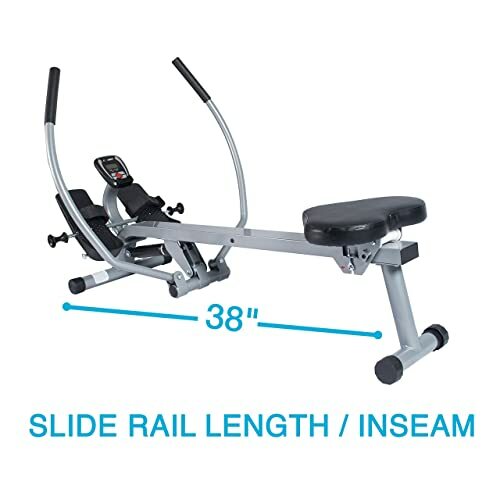 Another option with separate handles, the Stamina Body Trac is great for those who don’t want to invest a ton of money in a machine but still want something that will provide a decent workout. This basic model will not allow for a ton of power output, but it will suffice for most users who are looking for a way to get their daily dose of cardio in. It is stated to have a 250lb weight limit, which is low for a rowing machine, but for users who fall into that weight range it will survive several years of consistent use. The twelve levels of hydraulic resistance are adjusted with the turn of a knob underneath the machine. The handles are double jointed making each circular stroke smooth. The screen is basic but does all you need it to do in terms of tracking calories, distance, speed and time. One of the best features on this model is the comfortable seat. 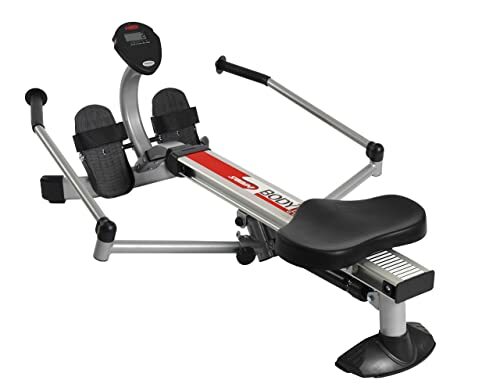 Many rowers have hard or small seats, but this machine has been designed with a large, molded seat that has enough padding to keep you comfortable even during long sessions. The foot pedals on this machine rock back and forth with each stroke. This could be annoying to users who are used to the stability of fixed pedals. However, the moving pedals create an extra challenge for your legs and can actually smooth out the ride once a good rhythm is found. The handles can be attached to the rail when not in use and the machine can be tipped on its end, making for easy, compact storage if desired. This is what you want if you have never rowed before or are not yet comfortable with the movement. The handles on the Sunny Health & Fitness are fixed to a metal pillar which moves with you as you row. This shortens the range of motion but provides an easy and comfortable exercise experience. The rail is angled, which make the leg muscles have to work harder to drive than a flat rail while simultaneously easing pressure on the joints. The hydraulic resistance can be adjusted with a quick turn of a dial at the front of the machine. The monitor simply tracks distance, time, speed and calories. No bells and whistles here, but for a standard workout it will suffice. Because of the limited range of motion of the handles and the shortened rail, you’re not going to get that full lean-back pull that you can attain with a larger or commercial machine. If you’re just learning the motion, however, you don’t need that extra space. This Sunny model is better suited to long duration rides rather than sprint intervals and if you take a real shine to rowing you may find you outgrow it quickly. That being said, it will still serve as a great way to warm up, get the blood flowing or loosen up joints and muscles no matter what the fitness level. Perhaps obviously, water resistant machines are the closest you can get indoors to the experience of rowing out on the water. The WaterRower is considered among the top water rowers out there and for good reason. The beautiful ash wood design makes up for the fact that this rower cannot fold up. It may take up a decent amount of space, but it’s no eye sore. It can stand up on its end if you would like to store it, but it’s still going to take up some room. The resistance on the WaterRower is supplied by the large water-filled jug at the front of the machine. While the resistance is similar to what you’d find out on a lake, the water level doesn’t change, which means the only way to increase resistance is by pulling harder. The monitor tracks distance, speed, stroke intensity and heartrate and is easy to read even from a distance. As far as upkeep is concerned, you’ll find that you don’t need to apply a lot of maintenance to this machine as even the pulleys and recoil belt don’t require lubrication. Here’s the real kicker – this machine can handle up to 1,000lbs in weight. No matter who you are, you can ride this machine. While there are many hydraulic resistance machines on this list, the Kettler Favorit reigns supreme due to its double-hydraulic setup. The industrial strength hydraulic pistons are attached to the handles and adjusted by moving a clamp on the handles themselves. There are 50 levels of resistance on this machine. You’ll definitely be able to find a setting that suits you. The machine handles up to 285lbs and while the machine doesn’t fold up, it also doesn’t take up that much room. The seat is molded and padded and slides along a steel track effortlessly. The foot plates are biomechanically designed to provide you with the best drive possible and rotate slightly with each stroke. They do not move nearly as much as some of the others on this list, which may be positive as it adds more stability. The large LCD display simultaneously monitors time, distance, pulse, strokes, calories and stroke rate. The labels are in both German and English. The Stamina Avari is top of the line when it comes to magnetic rowers. Magnetic resistance is extremely quiet, so this is a great option for homes with a new baby, or if you need to keep the volume down for neighbors in thin-walled apartment buildings. Footplates provide a natural pivoting motion but become stationary at the time you need to drive with your legs, easing any strain on your muscles and joints. Further protection is given by the slightly inclined rail that the molded and padded seat glides on smoothly. The resistance can be adjusted with the easy press of a button on the digital monitor. The monitor also tracks time, distance, speed and stroke count and the machine comes with a heart rate strap you can wear to track your pulse. Storage is easy with this machine as it folds and has wheels for transport. The Stamina Avari will support weight up to 275lbs and comes with a heavy-duty nylon chain that won’t fray or tear even if you’re pulling hard every time. The only downside to a magnetic rower is that the resistance can become less consistent over time compared to, say, an air resistance rower. This should not be a problem on this model but know going in that it’s a possibility. Can’t decide between a bike and a rower? Well guess what – you don’t have to! The Stamina Conversion is both a recumbent bike and a rower so you can vary your exercise with ease. The resistance is magnetic for both the bike and rower settings, and the pedals have thick adjustable straps for secure foot placement. The resistance is adjusted by turning a knob at the top of the machine. When not in use the rower handle sits atop the machine and out of the way. The seat on this machine is a full seat – it has a back and is actually quite large. This is great for the recumbent bike option, but if you’re used to a traditional no-back rowing machine seat, this feature may bug you. It does not allow you to get a full lean-back as you finish your pull. A cool thing about this machine is that the handle can actually be used as an upper body strength training tool. As they are on top of the machine, they are in the perfect placement for upright rows, bicep curls and more. There is a 250lb weight capacity on this bike and it folds for compact storage. The handles on either side of the seat track your pulse and the monitor also keeps track of your speed, time, distance, calories burned and number of strokes. The First Degree Fitness Newport rower is a stylish red and black. 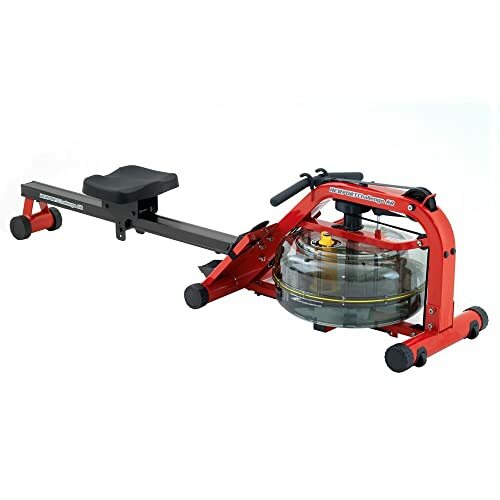 Another water rower, this is one that you’ll want to show off when giving a tour of you home rather than hide away. The water resistance is adjustable on this model through their patented adjustable resistance design. The handle is attached to a belt drive which makes the machine near-silent and means no oiling like you would have to do with a chain drive. The monitor tracks speed, distance, time, calories, split times and more. The foot pedals are stationary but the height can be adjusted so that the strap hits the right spot on your foot. The weight capacity on this machine is 300lbs and it can stand on its end when not in use if you need the space. With how good this rower looks, however, it may be a nice choice to make it a fixture in your home. Like the Concept2, this is a rower that would be found in commercial fitness establishments. It’s the best magnetic resistance option because it actually uses air resistance in conjunction with magnetic resistance to allow for maximum strength building as well as pace control, which is weaker in air resistance models. The 16 levels of resistance provide you with enough challenge to last you even when you start to gain more endurance and strength. It comes equipped with 15 preset programs to follow as well as 4 heartrate programs. The monitor can also track the progress of up to four separate users. The Lifecore R100 folds up if you would like to store it, although it will definitely still take up some room even at its most compact. It can handle up to 600lbs of weight and the seat is ergonomically designed for maximum comfort over long row sessions. The machine will be a bit louder than regular magnetic machines but will still be less noisy than a full air resistance model. If it’s in the living room you may hear it in the kitchen, but no one in the next apartment or on another floor of the house will be able to hear it. The pedals are not fixed and pivot a small amount, which may be more comfortable for people with less ankle flexibility. This machine comes with a belt drive rather than a chain drive, making it less prone to maintenance issues. One of the only complaints reported about this machine is the ball bearings in the seat – some say they give a gritty feeling when sliding back and forth on the rail. If a super smooth ride is high on the priority list for you then you may want to look into trying one of these out before you buy it to ensure that you don’t mind the feeling of the seat. So now you have options. But which one is right for your specific needs? Take the following questions into consideration before making your purchase to ensure that your rower suits your lifestyle and fitness goals. 1. How Do You Want to Use Your Rower? While any of the rowers on this list will give you a good workout, if you’re looking for something that will leave you in that state of pure, thoughtless exhaustion, better to go with a commercial grade rower like the Concept2 or the Lifecore R100. These heavier-duty rowers can take a beating and will provide you maximum stability while you pull like your life depends on it. Some of the models that are intended for home use only just cannot handle massive pulls time and time again and will eventually break down or just won’t provide the resistance you need to get the workout you want. That being said, home use only models will suffice for most users. Even if you’re hitting a more intense workout, odds are you’re not going to be pulling with such force that the front end of the rower is lifting off the ground (it happens – check out some serious CrossFit Athletes sometime). Just be honest about your fitness level and seek to buy a rower that can handle more intensity than what you can currently exert so that you have growing room. Rowers are not very wide, but they are long. 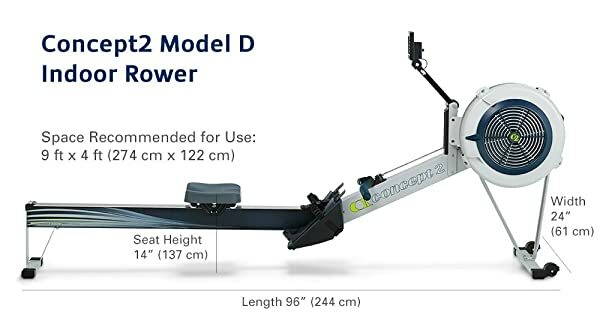 What a lot of people forget when they’re measuring out space for their rower is to add a few feet to their length measurement to leave space for their torso, which will extend farther than the end of the rower when finishing the pull. 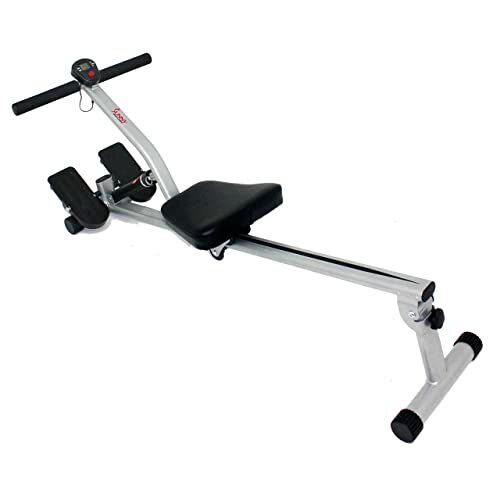 Many models, even commercial use models, fold up when needed, but the rower will still be pretty bulky. There are plenty of options on this list that take up less space than the standard full-length rower, but the sacrifice is less extension when you pull. 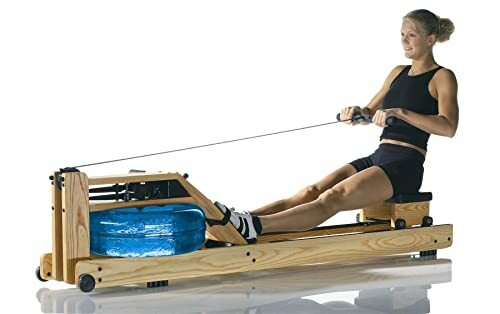 Also keep in mind that while the rower isn’t wide, you will want to leave a nice bubble of space around it so that you don’t feel cramped while riding. It’s easy to forget that your limbs may in fact extend beyond the width of the rower during certain points in the pull. 3. What is the Weight Limit? Most rowers will have a weight limit similar to that of other exercise equipment such as bikes and ellipticals. However, if you require a rower that can handle upward of 300lbs, fear not. The commercial rowers and water rowers are built for heavy-duty use and can handle upwards of 500lbs of weight while remaining sturdy enough for an intense workout. Don’t confuse weight-bearing with stability, though. There are plenty of models (like many of the others on this list!) that handle less weight, but are just as sturdy when in use. 4. How Quiet is Your Environment? Air resistance rowers can get loud, loud, loud. Rowers with magnetic resistance, however, tend to be near-silent. Water rowers and hydraulic rowers are somewhere in between. Some people love the sound of the whooshing and whirring chain belt and air fan with every stroke as it provides additional sensory feedback for the effort they’re exerting. However, if you live in a home with a baby or an apartment with thin walls, choosing a more silent option may suit your lifestyle better. Also keep in mind that if you go with a louder rower and you want to listen to music or watch television, you’re either going to need a pair of wireless headphones, or you’re going to need to turn the volume waaaaaaaay up, which only adds to the noise you’ll be creating with every workout. Rowers come in basically every price range these days, but there are some give and takes based on price. Generally, the lower-cost rowers will not be as big or as well constructed as the pricier models, meaning that they can’t take the wear and tear that comes with super intense workouts. However, most will be just fine with a budget option, especially if you’re just learning how to row or you know that even your maximum output isn’t enough to rattle the nuts and bolts of the machine. One of the really cool features that tends to come on many lower-price models is the handles. Commercial grade rowers tend to have the one single horizontal bar to pull with, but several of the options on this list have individual handles that actually provide more options as to how to exercise the arms while rowing. Budget is important when selecting your rower but make your list of the things that you would like to rower to be able to do for you first. Odds are you’ll be able to find the perfect model for you no matter what your price range. Once you get the rhythm and flow of the pull on the rower, you’ll get it forever. It’s like learning to ride a bike. Locking in on the proper form, however, can be confusing especially if your body has not had the kinesthetic experience of this type of motion. Here’s a basic overview of proper rowing form. Now your arms pull in until the handle touches the bottom of your rib cage. After all the momentum you’ve built up with your legs and torso, the finish should feel pretty light and easy. If you feel like your arms are doing a ton of work, odds are you’re either not driving hard enough with your legs or you’re pulling too early. The catch simply means that you’re back where you started. You should still have an engaged back, but your seat should be as close to your feet as possible and the handle should be pretty close to the front of the machine. If you’re working on shorter strokes then your range of motion will be less, but in general you’re looking for full extension and a full return, which sets you up for another identical pull. Give yourself some time if you’re just starting out to learn the form. Break it down into pieces and once you’ve got all the parts working separately, start weaving them together in to a fluid motion. At its best the rowing motion is smooth and continuous, with each stroke identical to the last one. Interval training is great on the rower. Short bursts of hard, fast pulls followed be periods of rest create what’s called the “after-burn effect.” This means that you not only burn calories while on the rower, but for a period of time after you finish your workout. Nothing like burning a bunch of calories while resting. Make your workout work for you by engaging in a Tabata style program. The standard is 8 rounds, but you can do a double (or triple!) Tabata if you’re feeling groovy. You can do a series of sprints, like 4 rounds of 100m sprints, with a minute or two of rest between each set. Sites like Pinterest or even a quick Google search will pull up some cool rowing machine workouts. And of course, you can just hop on and go for a lengthy ride if that’s what works for you. Rowers are pretty low-impact on the body, especially the joints. They are often used in training in place of running or even biking, depending on the sensitivities of the athlete. Overall, they are a great option for nearly everybody, as the resistance largely depends on the strength of the pull, and they work in line with the body’s natural movement patterns. However, the one area that gets people when using a rowing machine is the lower back. Unless there is a pre-existing condition, lower back pain or soreness that arises from rowing machine use almost always has to do with form. It is easy – especially as you become more fatigued – to round your back, get lazy with your legs and allow your muscles to go slack while rowing. Resist! Remember to keep your shoulder blades engaged by pulling them back and down and USE YOUR LEGS. This cannot be stressed enough. Your legs provide the power, and your torso and arms are the finishers. If you find that you just cannot hold your form any longer, take a rest and get back to it, or lower the resistance to make your pulls easier. Get. A. Rower. These machines use the body the way it was meant to be used. The lower body is meant to push, the upper body is meant to pull, and the rower lets it do both in one fluid motion. This machine is notorious for getting people in shape and keeping them there. Crew teams contain some of the most fit people on the planet. Why? Because the process of rowing against resistance requires a person to have balanced strength throughout the body as well as cardiovascular fitness. It’s a no brainer – if you want to lose weight and you have the money to invest, a rower will help you reach your goals without injury or an expensive gym membership. If you’re looking for a downside you won’t find one. Rowers are a great invention that help people get what they want in terms of fitness. End of story. 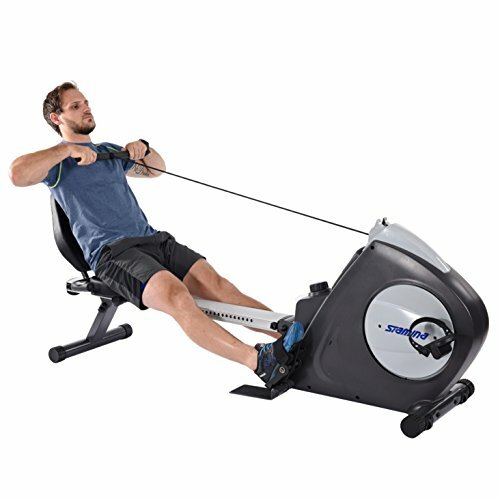 How Do I Take Care of My Rower? If you have a rower with a chain, make sure you oil it regularly. The sliding seat will also need cleaning and oiling periodically. Go by feel. If it starts to feel less smooth when you use it, then it’s time for a cleaning. A good rule of thumb is oil after every 40 hours of use. Magnetic or belt-driven rowers require less maintenance. Once the machine is assembled you should be good to go. It is possible to damage the machine through careless use. The most common way that rowers get damaged through use is the treatment of the handle, especially on a chain-driven rower. Never let go of the handle and allow it to snap back until it hits the front of the machine. Often there is a little holster for the handle near where you place your feet for the handle to rest before and after you ride. Use it. How Do I Protect My Floor from Damage? You’re going to want to place your rower on a hard surface more often than not. Get a mat to place underneath it that will still grip the floor and hold the rower in place but will save your floors from scratches. If you do want to place your rower on carpet, you can get a thick plastic mat with grips that will keep it in place on the carpet and stop your rower from feeling uneven. Also, heavier rowers will do better on carpet than lighter weight rowers. What Muscles Are Worked While Rowing? Nearly all of them. This is why the rower is such a wonderful machine. Your back, glutes, quads, calves, shoulders and core are all hit through the use of the rowing machine. Your arms are also worked, but if you’re rowing correctly you won’t feel it there as much because your larger muscles are taking the majority of the burden. Your chest is also worked a little, but it acts more as a stabilizer during the rowing motion. You should have your core engaged the entire time to protect your lower back. This means a major core workout for you without having to work it separately. Which is Better: Rowers, Ellipticals or Exercise Bikes? It depends on what you’re looking for. They serve entirely different purposes and their separate functionalities work the body differently. 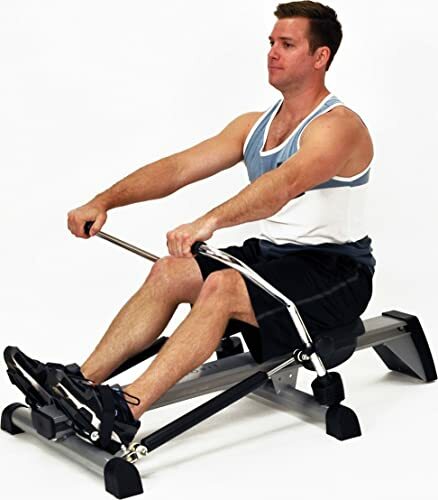 The rower works the whole body and torches a ton of calories in a short period of time. This sets it apart from an elliptical or stationary bike if you want something really effective for weight loss and muscle tone. That being said, while it is low impact on the joints, it does require much more exertion even at its lowest setting than an exercise bike or elliptical so if you really just want something you can take it easy on, a bike or elliptical may be better for you. If you’re having a hard time deciding the type of machine to get, seek a model like the Stamina Conversion II that is two machines in one. No reason you can’t have your cake and eat it too!